Bravo! You have a devoted a corner of your living space to the art of home entertainment. Maybe it is a slice of Polynesia or a refined oak paneled decor; in any case you are making progress toward living the home bar experience. The lighting is just right, bar is in place, stools dusted off, and the Hi-Fi (err I mean Ipod Sound dock!) is filling the room with lounge worthy melodies. Now all you need is booze and guests, but wait let’s not get ahead of ourselves. The second step to cocktail heaven is not a bottle of Hendrick’s Gin; you need to acquire the right tools to make your daring drinks. A professional set of bar ware tools can transform mixing a drink into a proper cocktail party. A chilled shaker combining ingredients for perfect drink distribution, a garnish tray filled with lemon twists, olives, pearl onions, and brandy soaked cherries, the perfect pour using a bar strainer, all these elements make for better cocktails and a lot more fun. Cocktail Shaker - Currently, stainless steel shakers are popular because the trend is cocktails shaken not stirred. Connoisseurs claim that this makes cocktails cold as the Klondike. Purists poo-poo this claim and insist that stirred not shaken is the real deal. Regardless of what side of this argument you support, you will need a cocktail shaker of some sort. The standard shaker comes in three pieces: the cap, the straining lid, and the body. However, there are dozens of varieties of glass, chrome, and stainless steel cocktail shakers on the market. Vintage shakers can vary in style and material depending on the time period of production. Art Deco silver and steel shakers were used a lot during the Roaring 1920s. Decanters and drink pitchers enjoyed widespread appeal in the 1930s and1940s. Glass shakers often decorated with colorful and kitsch cocktail recipes gained popularity in the Atomic age 1950s-early 60s. James Bond brought back the metal shaker by insisting on his Vodka Martinis shaken. All of these types of cocktail shakers can be used to enhance your home bar. As a fan of late 50s Italian design, my favorite is the 17 oz. Alessi 1957 Design Polished Cocktail Shaker. I have an extensive vintage collection of cocktail shakers. However, I rarely employ them for concocting drinks. Instead, I suggest using a 17 oz. Alessi for personal drinks or a 16 oz. stainless steel bar shaker and a no frills pint glass when making multiple cocktails. Granted my way isn’t as glamorous or dramatic as shaking a cocktail a la James Bond, but it is more efficient and can be used for making drinks that are shaken or stirred. The main advantage is the lack of shaker cap/top. During a rigorous mixing session the caps and tops can become stuck due to the vacuum created or the stickiness of the liquor. Condiment Dispenser – Purchase a four-piece or six-piece stainless steel or Rubbermaid condiment holder at a restaurant supplies store. Foodservice Direct has great deals, dispensers ranging from $10-35. The small glass or steel bowls may also be used if you don’t have a lot of room. . The main objective is to keep your cocktail garnish within easy reach. I bought a Cinzano brand professional 6-piece condiment dispenser on Ebay for under $20.00. However, it took months of diligent searching and being out bid on other brands like Campari and Beefeater before I landed this find. The aspiring home bartender can do it my way of the easy way. Double Jigger/Measure – Professional bartenders can judge a jigger worth of booze just by the pour. If you really must use a jigger to measure the proper allocation of alcohol, then buy a double jigger. Pedrini makes an excellent double jigger that measures drinks by 3/4 ounce (1/2 jigger) for the lightweights to the standard pour of 1 1/2 ounces (1 jigger). Bar spoon/stirrer - A long bar stirring spoon is used to measure small amounts of mixer and stir drinks. Muddler - to crush mint and sugar in Old Fashions or Juleps. Hawthorne and Julep Strainers – Stainless steel strainers to keep ice and extraneous ingredients from overflowing into your cocktails. Bottle Opener – you’ll need to open up beer bottles and cans of juice mixer so pick up bottle opener that can make holes in a can too. Paring Knife – is useful for cutting up garnishes and making citrus slices. Also get a Zester for citrus twists. Waiter’s Corkscrew – is easy to use and less cumbersome than a traditional wine corkscrew. Ice Bucket with Tongs or Scooper – Ice is a key ingredient for any successful cocktail. A medium sized ice bucket and tongs or a scooper should be kept next to the mixing area for easy access. Small Cutting Board – is needed to dice up garnishes. Swizzle Sticks – are used in mixed drinks like Gin and Tonics or Rum and Cokes. They are used to mix the drink and are a handsome decoration. Blender – for making frozen drinks like margaritas and daiquiris. I suggest the Kitchen Aid or Waring blenders for their high quality and retro style. Bar Napkin Holder – for cocktail napkins and your swizzle sticks. A professional bar napkin holder has side panels to hold swizzle sticks and other stirring tools. Highball glass - There are many types of Hi-Ball glasses. I prefer the Double Rocks 12-ounce variety. It is tall with straight sides and used to make mixed drinks. Martini Glasses – martini glasses make me so happy I break into song. The ultimate Cocktail glass, the martini glass can hold up to 8 ounces of lascivious liquid. Collins glass – for making tall drinks like Juleps or the eponymous Tom Collins. Old-fashioned glass - Shorter cousin to the High Ball, the old-fashioned is typically used for Scotch and other liquor that are imbibed neat. Snifter - Ports, brandy, cognac, Sambuca and other cordials should be served in a small to medium sized bell shaped snifter glass. The Flute - Tall and slim, the champagne flute holds just over 7 ounces. Besides champagne, the flute can be used for Sparkling wine, Bellinis, Kir Royale, and Prosecco. Wine Glasses - Large, stemmed, bulbous holding around 10 fluid ounces? Maybe if you have the room, I like the stemless Riedel O collection glasses for easy storage and entertaining, this glass is for serving fine red wines as well as some fruit-based drinks. Miscellaneous glassware – having a Tiki Party? Don’t forget to buy ceramic Tiki Mugs for Mai-Tai mayhem, Umbrellas, and punch bowls. Once you obtain the essential bar ware and glassware you will be ready to serve drinks like a professional. Below are some helpful links to bar supply wholesalers. I also suggest Crate and Barrel if you need bar equipment that is reasonably priced and stylish. Enjoy creating a bar at home and drink responsibly. Though cocktail etiquette says put the summer time drinks in storage with your straw hats, I like to extent summer until the Farmer’s Almanac says it’s over — September 21. So to better smooth the transition between the hot dogs days and the first chill of Autumn, I like to start out with a sweet yet sour Sidecar cocktail. The Sidecar was invented in Paris (maybe in the famous Harry’s Bar) during the First World War. The inventor, an American captain, named the drink after a motorcycle sidecar in which he was chauffeured to and from the bar. According to cocktail mythology, the officer was under the weather and desired an aperitif before dinner. Brandy would be used to combat a cold in those days yet is traditionally an after-dinner drink, so the captain suggested that the bartender add lemon juice and Cointreau to lighten it up. Vitamin C is helpful when fighting colds too and the Brandy warms you up. Voila — this classic cocktail was born. 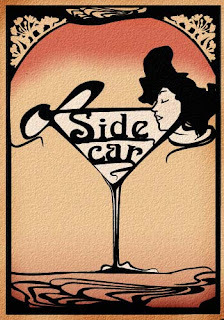 In the 1920s, the Sidecar became a signature drink for the Hemingway/Miller ex-patriot crowd in post-war Paris. In our opinion, the Sidecar might not be a panacea but it sure can lighten up your spirits. The combination of sweet (sugar on the rim) and sour (lemon juice & Triple Sec or Cointreau) plus smoothness of cognac make the Sidecar a pleasurable yet potent drink. However, I prescribe that you try not to drink more than two because they’ll knock you out faster than you can say general anesthesia! I like to enjoy an excellent Side Car at Hudson Bar & Books in Greenwich Village. Take a chilled martini glass and dip the brim lightly in a bowl of sugar as if you were preparing a Margarita with salt. Then combine the liquor and juice into a shaker. Shake it over ice and serve it up with a twist of lemon. Be careful not to chintz out. Please DO NOT use lemon juice from concentrate or dreaded sweet and sour mix!!! Not only is this a cocktail foul, but it actually will detract from the true flavor and effect of the Sidecar. Are you sick of the bar scene but enjoy having drinks socially? Does an intimate get-together with friends equate to shouting over blaring music at some terrible bottle service only venue? Are you afraid to entertain in your home because it lacks the social aspect of a bar or lounge? Well, if you answered yes to any of those questions, then have no fear - the Home Bar is here to make your pad a destination. Years ago people used to entertain in their homes and the cocktail party was the Rolls Royce of a social call. In the bustling suburbs, bars were set up on patios and theme parties like Tiki night were commonplace. In the city, Home Bars were a dime a dozen and ranged from a hidden away liquor cabinet with service utensils to a full-on bar built into someone’s basement. Amazingly enough to this Lounger, the concept of the Home Bar fell out of fashion. These days it seems like the art of entertainment has been lost. People are more interested in social outdoor activities, such as extreme sports, than they are in sipping cocktails at home. Hopefully we can change that. How much space you allocate for your bar/entertainment area is very important and will determine: a) whether the bar is right for you; and b) the type of bar you can construct. If you have limited space, then a bar that can be easily hidden or doubles as a piece of furniture may be preferable. Think about your living space and figure out how much of a commitment you want to make. If you have a rumpus room or other room you do not use much, you can convert this space into a bar. If you live in a cramped urban dwelling like a lot of people then a smaller closet-style bar or mini-bar is your best bet. A lot of consideration went into deciding what kind of commitment I was going to put into my bar. Space was the primary factor. I wanted to convert my living room into the bar area and, luckily, I had an apartment with a decent sized living area. The bar became the centerpiece of the room. The couch and other furniture flank it and are in fact sitting areas for guests to sip cocktails or eat. However, I had to sacrifice other furniture, like a coffee table or love seat, and even mounted my flat screen and DVR up on the wall for the full bar effect. Do you have enough room for guests? It is important that guests have room to mingle and moved around. A small entertainment space limits the number of guests one can invite to a cocktail party. Will you be serving food? If so, does the bar setup impede access to the kitchen? Will the bar be the centerpiece of the room? Will the bar compliment your current furniture arrangement or will you have to get rid of some pieces? 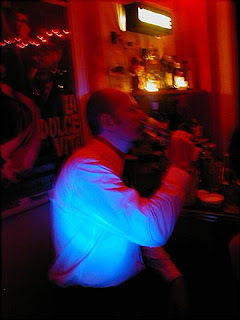 Vintage/Retro Martini Bar: Back in 1998, I turned my entire living room area into a ’50s style New York lounge bar. I painted the walls Millionaire Red, brought in a red vinyl couch and a couple of palm trees, and put up red Christmas lights, shelves and Italian Cinema and Campari ad posters. Bingo - the Red Room Lounge was born. I have moved several times since then but always reserved a room or a space in my living room for the Red Room (just scaled down these days)! Tiki Bar: Finding a vintage Tiki Bar is the ideal situation. However, they are few and far between, especially on the East Coast. In order to build one, you will need plenty of wood, bamboo, straw mats for the panels, and you must be willing to get your hands dirty with a bit of carpentry. If you are no Bob Villa, why not go to a furniture store specializing in wood (finished and unfinished) such as Gothic Cabinet Craft. Buy a wood bar and add the straw trim, bamboo panels, and other Tiki paraphernalia. Don’t forget that you will need a couple of bar stools to complete the look. Try flea markets or second-hand stores for wood or bamboo stools. Then you’ll have to decorate the living room, den, or whatever room you choose to have the Tiki bar in with a Polynesian motif for the full Tiki effect. If draping an entire room in bamboo is too much of a commitment, then I suggest decorating the area directly behind and around the bar with Tiki décor: paper lantern, leopard skin panels, straw, bamboo, shelves showing off your Tiki cup collection, maybe some flowers, and pictures of Hawaii. Pre-made Tiki bars can be purchased on ebay but it’ll cost you. In New York City, go to the Pearl River Market Store on Broadway and Grand near Chinatown for cheap Tiki accouterments. They sell straw mats, bamboo, and paper lanterns. Modern-style Home Bar: Crate & Barrel sells deluxe wine bars for upwards of $500.00. The other popular home furnishing stores like Pottery Barn or Restoration Hardware sell pricey wine and personal bars but I suggest hitting the flea markets, Salvation Army, and vintage stores for the real deal. Naturally, if you are constructing a Cellar Saloon then be prepared for high costs unless your cousin is a carpenter. Personal Bar: Can be purchased at any high-end home-furnishing store. Crate & Barrel and Pottery Barn offer mini-bars that can be stowed away when not entertaining. Bars made from wood and Formica are also available at some furniture stores but can be expensive. Bar stools can be purchased at any restaurant supply store. The Wine bar: A subtle piece of furniture that comes alive when guests have a craving for vino and cheese, the wine bar is perfect. This piece can be very expensive if purchased new, so scour the flea markets for deals on pre-owned wine bars. The Cellar Saloon: A conversion of a portion of your basement into a rumpus room! When I was growing up, I had a friend whose father converted the entire basement into a bar/saloon with pool table, darts, and professional-looking bar fully stocked with liquor, working sink, hanging rack for martini glasses, and stools for a half dozen people. I was amazed! This type of bar would require a major personal and financial commitment, but you’ll never need to leave the house again. True Home Bar Story: Angie Pontani of the World Famous Pontani Sisters told me that her father still has a Cellar Saloon in his basement. 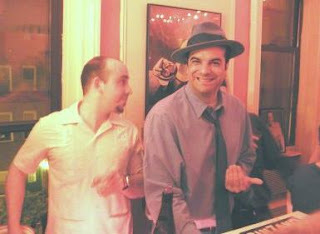 At clan gatherings, he makes the best gin martinis in Trenton, NJ and the familia just loves it! So dear readers, despite being hidden from public view, the Cellar Saloon is alive and well. How much will you spend? It can be cheaper than remodeling but still a luxury expense. Creating a home bar will not break your bank like remodeling a kitchen, but the cost does rise depending on how big your project will be. Believe it or not, setting up the theme bar is less expensive than a modern-style home bar. My bar arrangement cost about $500-$600 over a period of several months. The bar and stools were $250 and the rest of the gizmos and do-dads (posters, lights, paint, shelves, plants, etc.) cost another $300. I already owned a mini-fridge so that saved a bit as well. Enjoy creating your bar at home and hey - drink responsibly! Havana, 1898. Cuban political activist, writer, journalist Jose Marti enters Havana with Teddy Roosevelt’s Rough Riders to cheering crowds as the last Spanish forces flee the island. To celebrate this victory and freeing of Cuba from Spain’s colonial yoke, Senor Marti mixes Bacardi™ rum, gin, and American soft drink Coca-Cola™ to symbolize the unity between Cuba and her northern big brother. Marti dubs the drink “Cuba Libre” and proceeds to tie one on with the future president of the Untied States! If that sounded too good to be true, you are right. Unfortunately, Mr. Marti was killed in battle with Spanish forces on May 19, 1895 and Teddy Roosevelt was a Mint Julep man. Legend has it that circa 1900, an unknown officer of the U.S. Signal Corps mixed the first Cuba Libre in an Old Havana bar to alleviate the unbearable tropical heat. He toasted ‘por cuba libre’ and the drink was born. La Storia: The original Cuba Libre differs from its modern equivalent. Apparently, it was made up of rum, gin, dash of bitters, Coca-Cola and a lime. The drink remained a local favorite well into the century and did not gain prominence outside of the Caribbean and southern United States until the 1940s when the Andrews Sisters recorded a song called “Rum and Coca-Cola” (1945) while in Trinidad. This catchy and steamy tune was a marketing coup for the rum producers. It was during the Trader Vic Rum/Tiki craze of the 1940s and ’50s that drinks such as the Cuba Libre and the bastardized Rum and Coke became popular. Rum was cheaper than whiskey or gin and Coke tasted better than club soda or tonic water. In no time, Cuba Libres were being mixed all across America from swank urban cocktail lounges to tiki torch-lit suburban patio parties. The Drink: The ingredients that go into the modern Cuba Libre are rum (light or dark but not spiced) freshly squeezed lime juice, Coca-Cola™, and a slice of lime. Purists believe the Cuba Libre should only be served with Bacardi™ brand rum, however I disagree. First of all, the Bacardi™ available on the world market is in fact made in Puerto Rico. The original Bacardi™ factories in Cuba were commandeered by the revolution and the Bacardi Company fled the island and set up shop in the US commonwealth. Therefore, I drink my Cuba Libres with real Cuban rum - Havana Club light or dark. Atlanta doctor John Pemberton created Coca-Cola™ in 1886. Originally used for medicinal purposes, it was offered as an alternative to bitters and it had a kick too: real cocaine that made the “exotic” Coke an instant crowd pleaser. Crucial in a proper Cuba Libre, Coke has since lost its cocaine edge and went on to become a pop culture symbol of American marketing. Some places use Pepsi in the drink, but the taste is very different to the connoisseur. Coke is it — or order a different drink. 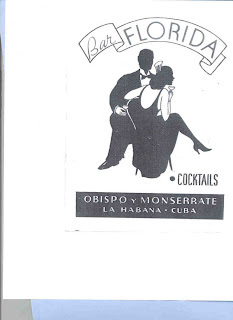 * Bar Florida aka La Floridita - in Hemingway's old Havana haunt is probably the best place to get the real thing. * Café Cabiria (Firenze, Italy) — when in Firenze (Florence) and wanting a hit of rum to break up the daily wine intake, I head across the Ponte Vecchio to Piazza Santo Spirito. There you will find a hopping little bar/café named Cabiria where your Cuba Libres are served with real Cuban rum - Havana Club. They are made to perfection and are a rum lovers delight. * The Deco Lounge (at the National Hotel South Beach, FL) — getting served a properly made Cuba Libres while smoking a Cuban Cohiba in the Deco Lounge is as close to heaven as this Barfly can get. The place is Al Capone slick and they take their time making top shelf cocktails. Squeeze juice of one slice of lime over 2-3 ice cubes into Collins glass, stir, and serve up with twist of lime.